This ebook is all about picture books! Picture books are especially close to our hearts. We’ve been fortunate enough to work with fantastic editors on the way to having our own published. And over the years, we’ve coached hundreds of other picture book writers, offering them feedback about how they can make their manuscripts stronger and more marketable in today’s competitive publishing environment. There are 10 key concerns that we end up addressing over and over again when we do picture book critiques. Many manuscripts have two or three of these problems in place—and almost every manuscript we critique has at least one of them! So we have focused on those 10 issues in this series of short essays. Each essay highlights one of the 10 key questions you will want to ask yourself about your manuscript. And if you find that your answer is “Yes—that is a problem for me,” we offer easy-to-apply writing tips to help you address that concern in your revisions. Read a sample essay here. ..Visit the book page on Amazon and click on LOOK INSIDE! to check out the table of contents, read the Introduction, and read part of Essay One. 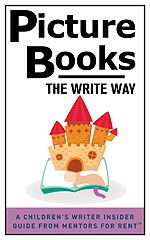 We hope this book will help you take your picture book manuscript to the next level!